Critical thinking and reading allow you to enter the academic learning community and become aware of current debates in your field. When you reach the writing stage, it's your opportunity to contribute to issues relevant to your course of study. But before you turn to the keyboard, it's important that you understand how writing at university differs from speaking and other forms of writing. You'll also need to become familiar with some of the writing conventions or ‘rules’ that academic writers follow in their disciplines. How is writing different from speaking? How is academic writing, in particular, different from other kinds of writing? And why? 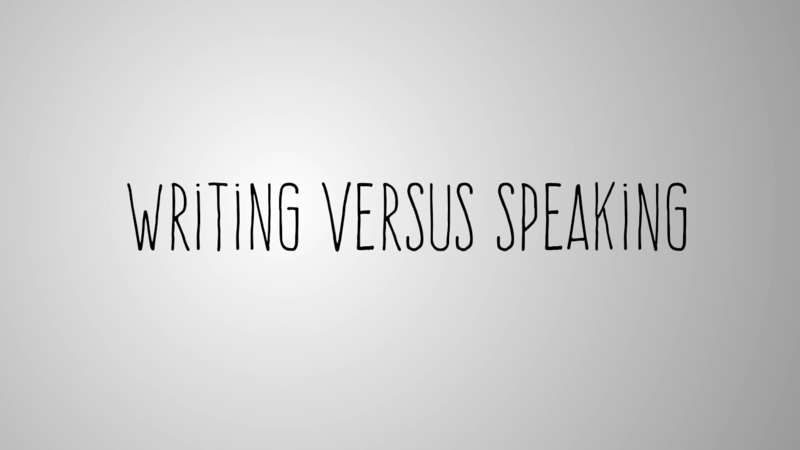 So, firstly, what is the difference between speaking and writing? Well, study and research at university are all about communicating knowledge: your ideas, your opinions, hypotheses and discoveries. And of course you can do this, through either speaking OR writing. But writing has a special importance in our work at university. Its purpose is to provide a long-term record of ideas which we can come back to over time. Speaking, on the other hand, has a more temporary life. The semi-permanent nature of writing is significant because it requires different mental processes; that is, the ways we deal with and process information when speaking and listening or reading and writing are different. In short, we don’t write the way we speak. Customer: Hi. Um, do you have the, the salad rolls, um the ones you had here yesterday? Um ... the ones that look like those. Like those over there. Cashier: You mean these rolls, these salad rolls? Customer: Ah yeah, salad rolls. Um, do they have ham in them? Um, can I get one of those, please? Cashier: Yep that’s right. There you go. Anything else? Customer: Umm, I think that’ll be right... oh ah, and a flat wh… flat white too? Cashier: Sure can. That’ll be 10.90, please. Paywave? Ah, that didn’t go through. Would you like to try again? Now take a look at the written transcript of that conversation. There are a number of features that underline the immediacy of conversation. For instance, speaker familiarity. They’re familiar with the setting; they know what to say and do. The interaction is informal; there are no names, just ‘hi’. There are a number of short sentences. Notice for instance, that one word 'Paywave?' is an entire question and there are many false starts and fillers: 'um', 'like', 'Anything else?' and so on. The exchange is full of repetitions and there is body language. The speakers convey meaning and emotion with a frown if they don’t understand, or by pointing at something, or by leaning forward to show interest. As you can see, including these things make the written version of the conversation quite hard to process. When writing, though, time is on your side. You can reflect, reconsider, re-read and reshape your message as often as you want to. Of course, once your writing is out there, you can’t check that your message is being understood. And you can’t rephrase or explain it in more detail because your reader is in another time and place. So, as a writer, you will need other strategies to get your message across. First, you plan what you want to say – which is your content. You'll organise the material to give it a framework and you'll choose words that are precise and appropriate – your vocabulary. Your sentence structures will often be dense and include several pieces of information and you may even use graphics to help make the meaning clearer. In the same way, your readers will also exploit the advantage of time. They'll use their background knowledge to predict the framework that will probably be used, for example: is it an essay in an Arts subject? Is it a newspaper article? Or is it a dating website? They'll interpret cues like your paragraphing, your headings and your signals. They may also use a range of reading skills first to get an overview of what you’re having to say and then a more detailed idea of the content. They can also exploit this time advantage by re-reading specific sections as often as needed. So in writing we need to pay conscious attention to what we write and how we write it because we are not face-to-face with our audience. We can’t gauge our audience’s response, or rephrase anything, or explain in more detail. What’s written is fixed for the reader, and so it has to carry the message clearly. How is academic writing different from other forms of writing? 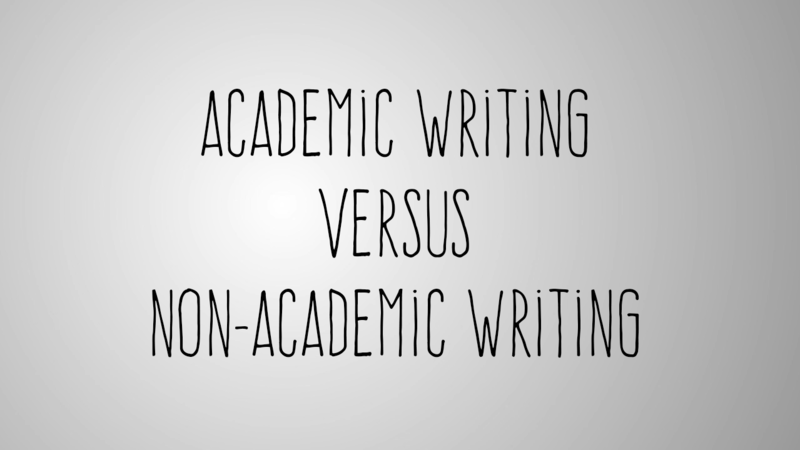 What are the differences between academic writing at uni and the other kinds of writing? The simple answer is the features of writing that we’ve just discussed: planning, vocab and the like. Why? Well firstly, the purpose of academic writing is to convey complex knowledge as simply and as effectively as possible. After all universities are all about exploring knowledge, passing on what is already known and finding out more. So academic writing has to balance the concepts of complexity of ideas and effective communication of knowledge. precision --- your meaning should be exact. accuracy --- to the best of your knowledge, what you are saying should also be correct. detail --- you need to be able to show and convey understanding of the topic. You want to be relevant (relevance) --- because your reader doesn’t want to be wasting time on unrelated information. And you need to show tentativeness --- Because one of the cool things about research is that you make new discoveries, you modify, you can change and occasionally disprove older ones (remember the Earth was once the centre of the universe). For that reason, we avoid stating everything as unalterable fact. You need to show logical reasoning --- because you want to persuade your reader that you've thought your ideas through and you've built up a well-supported argument. And formality --- because you want to show that you are serious about the topic. You need to show detachment --- because you want to show that you can be objective. And you need conciseness --- this is the hardest of all because the reader wants a complete understanding of the information in as few words as possible. If you want to stop people getting too heavy, it works best when they’re young and still at primary or high school, including the kids that miss a lot of school. When they’re older they could get something that’s hard to cure once they’ve got it. Obesity prevention appears to be most successful when implemented prior to or during adolescence as childhood obesity may lead to secondary, possibly irreversible illnesses in later life. Notice we’ve removed the personal reference ‘you’ – this helps create detachment. The vocabulary has become more discipline-specific: ‘Obesity’ as opposed to ‘getting too heavy’. It also offers a little conciseness. Note that colloquial and informal words like 'get' and 'kids', vague references (people, they), and contractions (they’ve) are not used in the revised version. The overall changes to the words used and the sentence structures help achieve detachment, formality and conciseness. All academic writing embodies these ideas in some way because they carry out the purpose of effectively communicating complex ideas to other members of the university community, locally and globally. Of course, within the University, different departments have different writing requirements and expectations. You will find, for example, that the Arts and Sciences interpret these ideas in their own way. They’ll give precedence to some qualities over others. Highly regarded qualities are called the conventions of the subject area you are studying, and you will be expected to use them in your writing. Videos under copyright. © The University of Auckland 2017. All rights reserved.